The last match that was played in the Nigeria Premier League 2010-2011 was on 13.03.2011 and the league is now on an indefinite break. However, there is plenty of activity at the different clubs and in this post I will write about some of the transfers and rumors that has been reported for the last 1 ½ month. * Bukola Babes FC has been a sensation so far this season and naturally there are several rumors surrounding some of their hottest prospects. Unconfirmed reports suggested that right-back Cletus Promise James and playmaker Daniel Essien Etor had joined Niger Tornadoes FC, while left-winger Effiom Otu Bassey and central midfielder Kingsley Salami (born 27.02.1987) had joined Heartland FC. On 07.04.2011, Daily Sun reported that none of these transfers had taken place. However; don’t be surprised if these players leave Bukola Babes FC during the next couple of weeks, not necessary to the mentioned clubs as Sunshine Stars FC, Enugu Rangers FC and Ocean Boys FC apparently wants to catch James, Salami and Bassey respectively. Bukola Babes FC has also made some interesting signings. Otunba Olusegun is an unknown player to be but the bulky striker was apparently top scorer at Babanawa United FC in the Nigeria National League (second level) in 2009-2010. Olusegun is apparently joined by central defender Chinedu Ajanah. Ajanah is a product of the Kwara Football Academy and started the current season at Kwara United FC before returning to the academy. * Leaders Dolphins FC will apparently maintain their squad for the second half of the season. Before the season it was reported that defensive midfielder Obinna David, formerly of Zamfara United FC, would join Dolphins FC. Dolphins FC experienced some problems when trying to register the player but David will apparently be part of the squad when the second half of the season kicks off. * King Osanga (born 06.10.1990) has apparently joined Kaduna United FC on a loan deal from his Libyan club Al-Nasr. Osanga made headlines in 2007-2008 and 2008-2009 when he starred for Akwa United FC. He joined Heartland FC in 2009-2010 before making a high-profile transfer to Tunisian top club Etoile du Sahel. He scored one goal for his new club before joining the Libyan league in January 2011. Osanga is a versatile attacker, often found on the right-wing. Osanga has played for both Nigeria B, Nigeria U-20 and Nigeria U-17 and could very well become a revelation at Kaduna United FC. 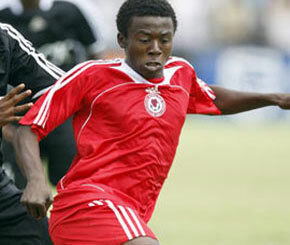 The picture is of Osanga from his days at Heartland FC. It is taken from zerozerofootball.com. * Kwara United FC is apparently interested in three players from Plateau United FC, top striker George Akpabio (4 league goals so far), winger Stanley Dimgba and the Ghanaian central defender Ahmed Mohammed. According to some sources, the players will join Kwara United FC for the 2011-2012 season. Several players of the club are apparently placed on the transfer list, including central defender Monday Osagie, striker Soga Sambo (born 05.10.1985), substitute goalkeeper Mustapha Salihu (born 01.12.1987), youngster Yemi Olarenwaju and striker Lekan Agunloye. As already written, central defender Chinedu Ajanah has apparently joined with Bukola Babes FC. Some sources also reports that attacking midfielder Sibi Gwar (born 09.09.1987) is leaving Kwara United FC, somewhat surprising to me. It was also a shock to read that the much-hyped Kevin Kpakor, a young attacking midfielder / winger, apparently is unwanted for the second half of the season. The teenager is an offensive and aggressive footballer with an eye for goal, but has yet to shine for Kwara United FC. * Lobi Stars FC has signed two experienced midfielder, both with matches in the African Champions League on their CV’s. Daddy Bazuaye (born 11.12.1988) joins from Niger Tornadoes FC and Otanwa Otanwa (born 03.10.1984) joins from Wikki Tourists FC. Both are former players of Enyimba FC. Lobi Stars FC has struggled with their goalkeepers this season and has therefore signed a more experienced goalkeeper in Danladi Issah from Niger Tornadoes FC. These three transfers could very well prove to be decisive for the survival hopes of the young and inexperienced Lobi Stars-side. Ebele Okolo, a midfielder from amateur side FC Internazionale Enugu, is another exciting newcomer. Okolo was training with Heartland FC before the 2010-2011 season. * Niger Tornadoes FC has apparently replaced goalkeeper Danladi Issah with youngster Ibrahim Auta from the Frimpong Football Academy. * Plateau United FC has apparently sacked several of their best players, including goalkeeper Abdul Isa (born 10.08.1985), experienced left-back Ajibade Omolade (born 12.06.1984), midfielder Daniel Njoku (born 08.10.1983), playmaker Ibrahim Kabiru Waziri and former Dolphins-player Eze Nwobike. * Sharks FC has apparently made a major signing in Andrew Michael (born 04.08.1992) from Ocean Boys FC. Michael, a burly and lively striker, has scored three league goals this season. * Shooting Stars FC is apparently interested in a striker called Kola Odunbaku, playing for an amateur club in Lagos called Comets FC. Fans of Shooting Stars FC will be shocked to read about the rumors suggesting that star striker Gbolahan Salami (born 15.04.1991), presented in my post from 13.11.2010, is on his way to Sunshine Stars FC. Salami played for Sunshine Stars FC in 2007-2008, 2008-2009 and 2009-2010. * Struggling Zamfara United FC has brought several players to the club. The most profiled is arguably speedy striker David Abidoye (born 23.11.1987) who apparently was a fringe player at Niger Tornadoes FC in the first half of the season. Abidoye was impressive in 2007-2008 when he scored 7 goals for Kwara United FC. He has also played in Vietnam for TCDK.SLNA. Other signings include Sunday Emmanuel and striker Emmanuel Makadas, both former players of Wikki Tourists FC. Dear Sir, I do remember that Kola Odunbaku was on the radar of Shooting Stars FC a year ago. I hope he will join a top level team soon! It is almost impossible to find exact information about games played. Here are some basic stats about Soriola – he has played matches for the Nigeria B national football team and the Nigeria U-23 national football team. Mgbam has played matches for the Nigeria U-17 national football team and the Nigeria U-20 national football team. He has never played in the Nigeria Premier League as far as I know. James Ubeh Akotoh is completely unknown to me. Are you sure his name is written correctly? I have wondered about the same but so far I have not found any websites showing the matches. I am sorry that I cannot help you.